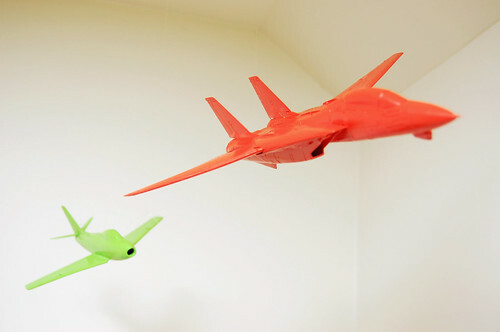 A while back I hit upon the idea of hanging a few model airplanes from the ceiling of our baby daughter's bedroom. I wanted to them to be accurate and to scale, but I decided to paint them all in bold, monochomatic colors, so they were kid-like too. There will be four in total, all at 1/72 scale, and here are the first two: A green F-86 Sabre chasing an orange F-14 Tomcat in the skies above our kid's changing table.